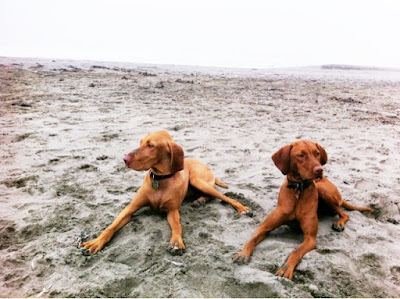 Riley & Cooper went on their first trip to Fort Funston yesterday. It was what I would call a "series of unfortunate events". They were playing a game of keep-away in the front yard early that morning when Cooper slipped and fell on the brick walkway. He yelped a bit when he fell, but otherwise showed no signs of being injured. On the drive to Fort Funston we stopped at a gas station to fill up & it was then that I noticed the blood trickling down his leg. Thankfully, it was just a surface wound & he had scratched off the top layer of skin. I rinsed it with some water & we were on our way. We arrived at the Fort Funston stables late, so we were looking for a way down to the beach when we noticed another Vizsla in the distance. I let Riley & Cooper off-leash and we went over to meet up with the other pup. This was when we realized there was a steep drop between us & the beach. We found the easiest (so we thought) pathway down and set off. About half-way down the trail went from a nice slope to an uncomfortably steep angle. The dogs were having a blast running around & making the humans feel very clumsy! There were some spots that were so steep we had to slide down on our rears to keep from slipping & falling. We finally made it to the bottom when we realized there was yet ANOTHER cliff we had to climb down to get to the beach! My dad found the easiest way down & the rest of us followed. Cooper was very nervous about climbing down! Riley climbed down & then went back up to encourage her brother to follow. The beach itself was gorgeous & the pups had a blast running, swimming, & chasing birds. 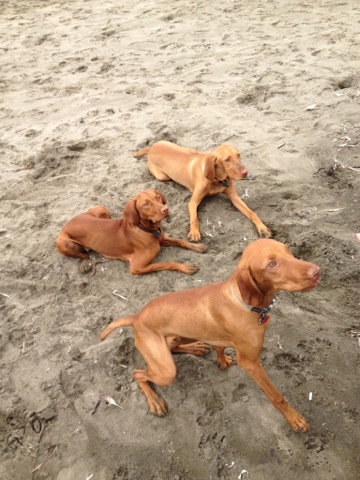 We met up with the main group of Vizslas toward the end & the pups got to play with their buddy Louie. It was a nice beach but there were too many groups of horses for us to be able to relax. The beach is apparently empty at around 7:30AM but I don't think it's worth it to get up that early just for a beach trip. our pup Yuba was there yesterday afternoon around 2:30-4:00. must have missed you! she is from Bailey and Sophie's litter March 2012. we live in SF near Dolores Park and take here there most weekends.